I try to make a lot of banchan (Korean side dishes) on the weekends. During the week, I can just eat them cold right out the fridge with some steamed rice that’s always waiting for me in my trusty rice cooker. If I’m feeling a little more ambitious, I would fry up an egg and make bibimbap. And if I’m feeling even more ambitious, I would make gimbap. It doesn’t happen too often, but often enough for me to sate my occasional gimbap cravings. On a side note, you may also know gimbap as Korean “sushi” because of its similarities with the Japanese Futomaki. Marinate the beef by combining sliced beef, garlic, tamari, sugar/agave nectar, sesame oil, and black pepper. Cover and set aside. While the beef is marinating, prep the vegetables. Heat a pan on moderately high heat. Add 1/2-1 TB oil and swirl. Take the beef out of the marinade and add it to the pan. Sauté until cooked through. This should happen within minutes due to the thinness of the beef. Place a piece of dried laver on a bamboo mat. Spread out 3/4-1 cup of the gimbap rice over 3/4 of the laver, leaving the 1/4 of the laver farthest from you empty. Place a layer of carrots, cucumbers, kale, bulgogi, pickled radish, and a strip (or two) of eggs on the rice. Try to stack the filling ingredients on top of one another. Roll away from you by pulling up on the edge of the bamboo mat closest to you, and folding the rice and laver over the filling. Squeeze and roll again creating a nice round cylinder, peeling back the bamboo mat as you roll (see image above). Roll tightly. Repeat with rest of the rice and laver. 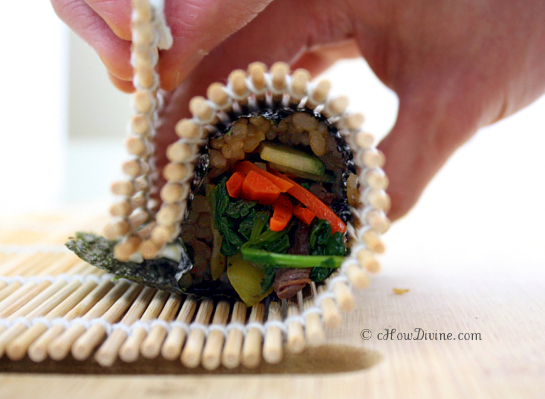 Cut the gimbap into 1/2-3/4 inch pieces with a sharp knife. Wipe the knife as necessary with a paper towel soaked in some oil. Serve on a plate or in a bento box. Enjoy your gimbap! You will have some filling ingredients left over. You can store the leftover fillings in the fridge for a few days. With the leftovers, make some bibimbap or bibim guksu with some gochujang sauce. When making gimbap, make sure the rice you are using is short grain. Short-grain rice is stickier which is necessary for the sushi to keep its shape. Some markets carry “sushi rice,” which is just short-grain, white rice. “Sushi rice” is a safe option. And you can use as much or as little vegetable fillings as you want. It’s up to you. However, use less filling if you are a novice. It will be much easier to roll. 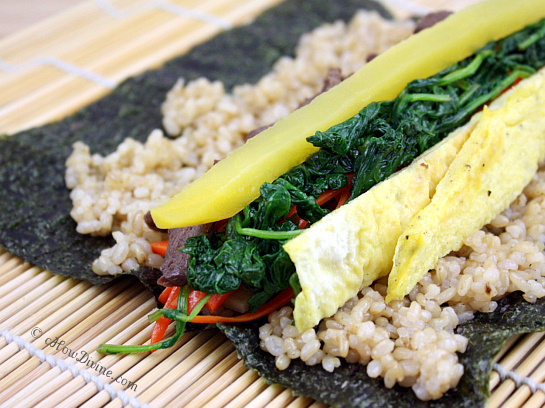 If you want to make Vegetarian or Vegan (adaptable) Gimbap, you can find it here. Other options for fillings include (but not limited to) kimchi, fish cakes, cheese, imitation crab, and perilla leaves. I am a big fan of gimbap. I always get a roll whenever I can at a Korean restaurant. The the addition of sirloin sounds like an awesome idea. It’s time for me to take out my bamboo mat and make some sushi! Thanks for sharing this!! I’ve never had a gimbap roll, but I sure want one! WOW! What a beautiful and delicious roll. Can you just roll up a couple and send to me? 🙂 Lovely! I would love to send some your way MJ! Believe it or not, my aunt used to send me side dishes via overnight mail! 😀 Thank you so much for your kind words! Absolutely GORGEOUS! My mom taught me how to make this (she loves going to Korea and now even learned to speak pretty fluently!). I really love your photograph and it made me want to eat this right away… despite it’s 11pm! Love your detailed recipe too! Oh this is so mouthwatering! 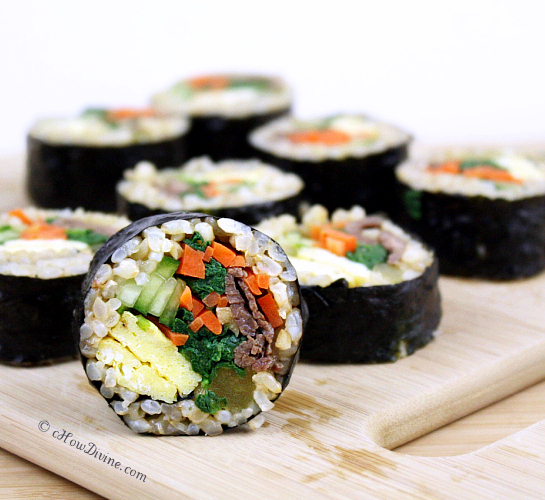 I can’t resist bulgogi…but whole gimbap look absolutely what I need right now. Delicious and tempting pictures as always! That looks delicious!! And OMG, your photos are beautiful!